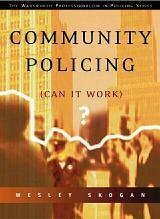 Be sure to purchase: Community Policing: Can It Work? My indictment of Chicago: "there are not many Scots, I am afraid." could serve as models for other cities. projects that meshed easily with the established programs and organizational structures. sustainable within existing resource constraints, or could be terminated without disruption.